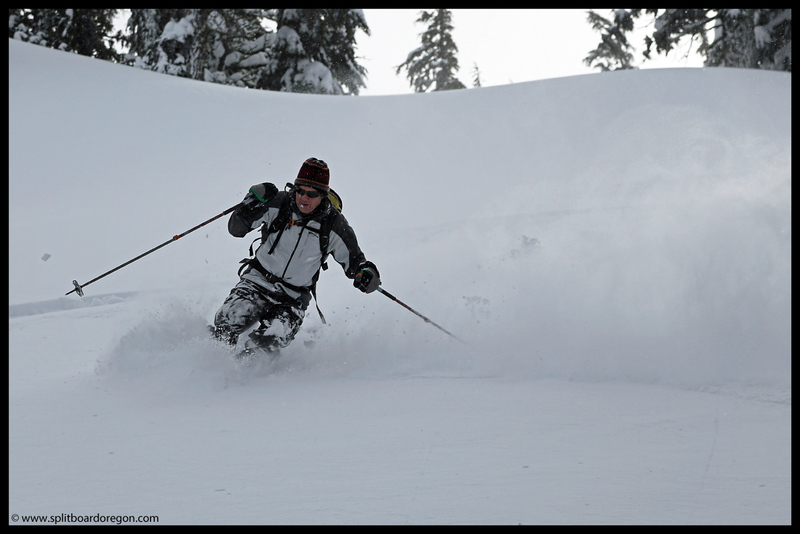 The annual hut trip to Tam McArthur Rim with several of my closest ski buddies is something I look forward to all year long. 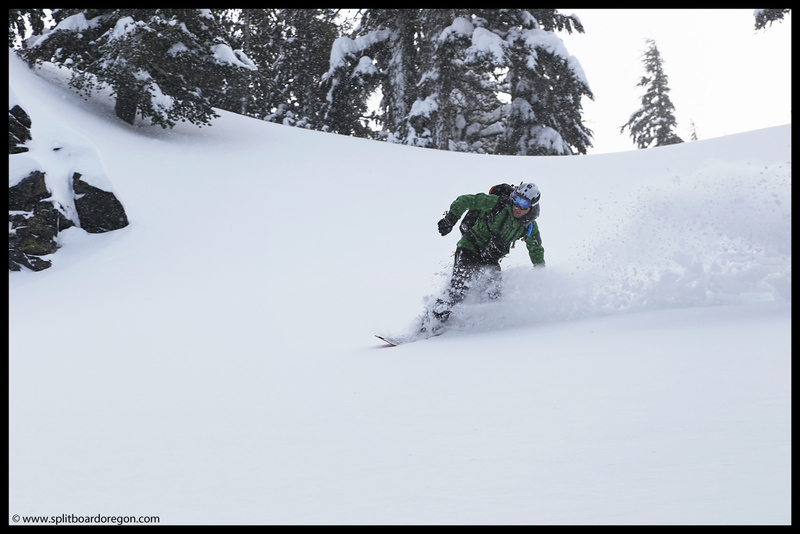 This year was no different, but given the poor conditions we’ve been suffering through this winter it was hard to imagine scoring really good snow like we’ve had in year’s past. As luck would have it though, a shift in the weather pattern and breakdown in the off shore high pressure ridge occurred a few weeks prior to our trip. By the time we left for the huts, over 5 feet of fresh snow had fallen in the previous two weeks, and by the end of our trip another 3 feet of fresh had accumulated. Needless to say, everyone was stoked as we geared up for our fifth trip in as many year’s to stay in the huts owned and operated by Three Sister’s Backcountry Inc. Andy crashed at my house on Sunday night, and we hit the road early Monday morning, arriving at the Upper Three Creeks snowpark to find the rest of our crew which included Todd, Dan, Joe & John. It was windy and snowing, with gusts approaching 50 mph, and it felt good to be in the midst of a full on winter storm. As we unloaded gear, everyone was clearly stoked. 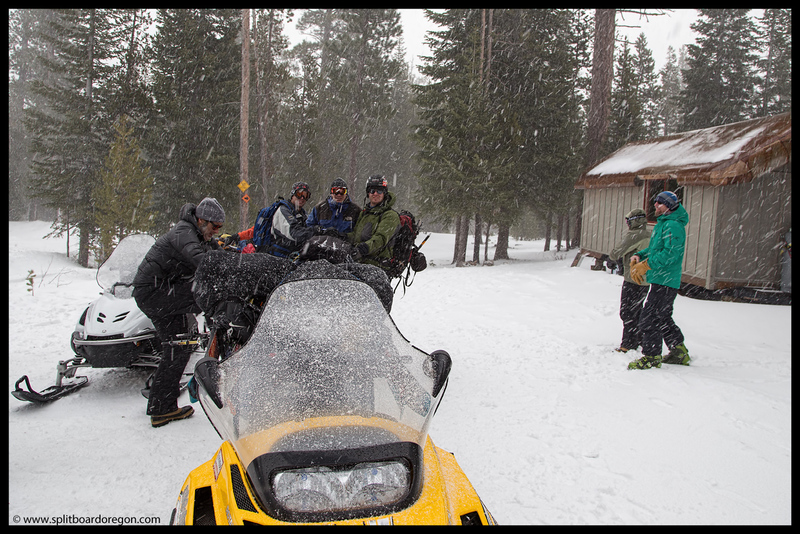 A few minutes later, Shane and Jonas pulled up, and we began piling our gear onto the snowmobile trailers. The amount of gear we had was impressive, but the 1000cc sleds can pull quite a load. When everything was situated just right, the six of us plus all our gear and Shane headed up the road 6 miles towards the huts. 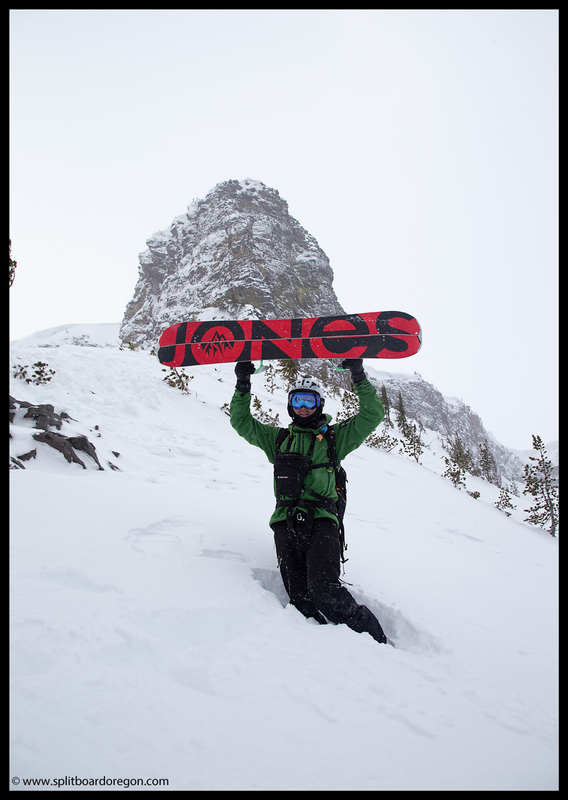 Even with all of us plus gear, the sled broke trail through a foot of fresh snow without a problem. The winds howled on the ride in, and I pulled my face mask up a bit higher and used my jacket to shield my face at times to keep my nose from freezing off. Soon we crossed the creek and frozen lake and pulled up to the huts. Our group claimed the Owl hut while the others took the Raven. After unloading the sleds and situating our gear, Shane gave an overview of the snow conditions and some changes to the huts. Then, after a quick beacon practice session, it was time to hit the skin track. 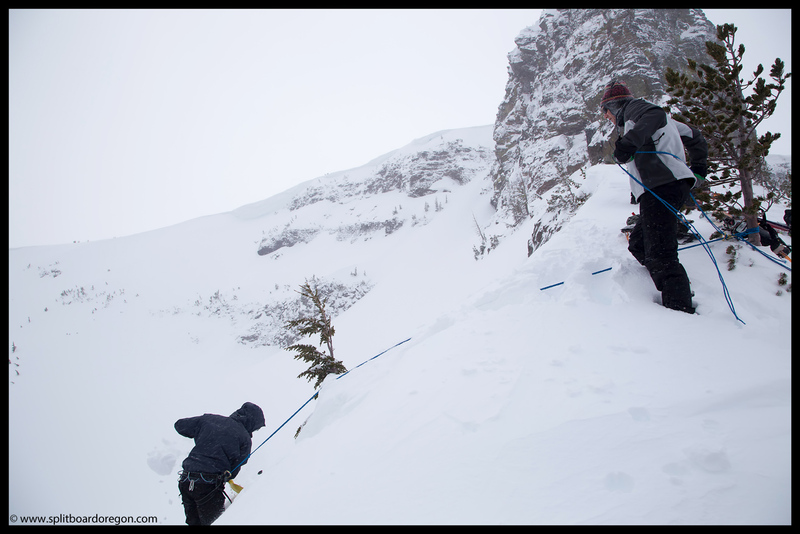 Given the high avalanche danger and windy conditions, we set out behind the huts and worked our way up to the terrain beyond the playground area. With six of us this year, as opposed to three or four the previous years, breaking trail was much easier. 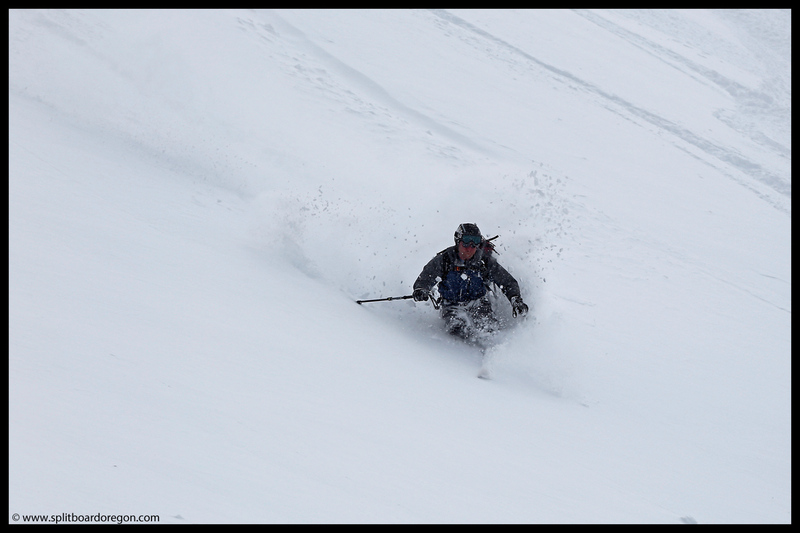 On top, we transitioned from skins into ski mode and headed down a conservative tree line back to the huts. The turns were good, but would get much better as the trip went on. 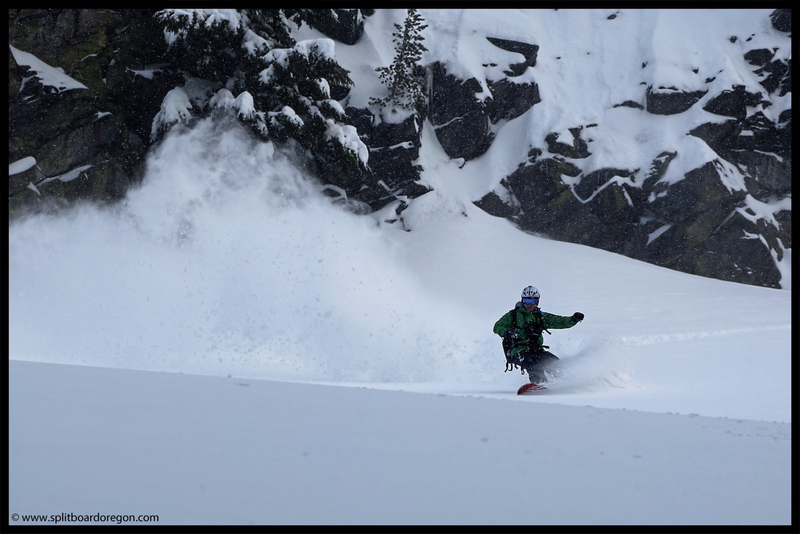 Below is a shot of Dan enjoying some of his first turns in the Tam McArthur area…. The snow in the Playground was premium, so heading back up for another lap wasn’t a difficult decision. 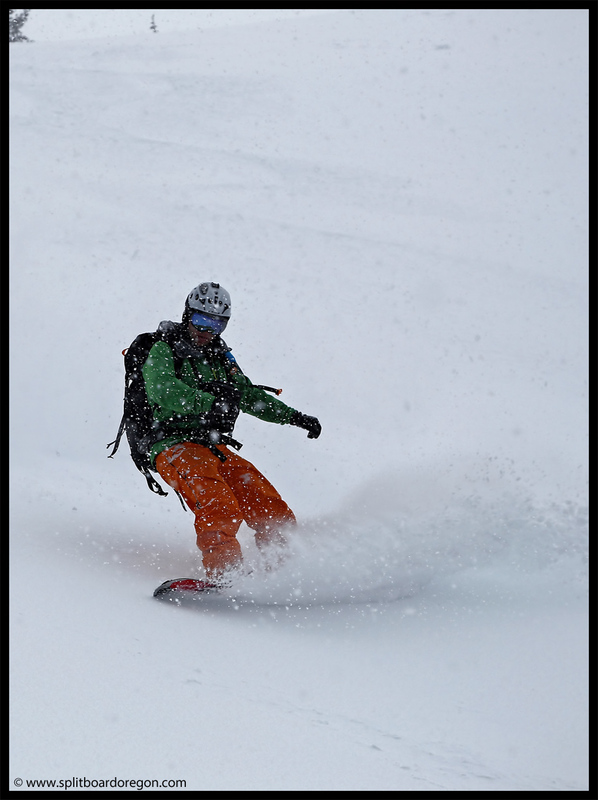 In fact, we made several more before heading in for the day around 4:45, tallying around 3500 vertical for the day, not bad considering it was a powder day and we didn’t hit the skin track until 11:30. For dinner, we enjoyed a killer chicken dish Dan cooked up, along with our choice of beer, which for me was an Expresso Stout from Oakshire Brewing. After dinner, we settled into the hut life as the storm raged on outside. I fixed up my favorite backcountry concoction, a pink lemonade vodka slushy made with fresh powder snow. The night consisted of a lot of bs, and a couple from the other yurt, Jen and Andy, came over and joined in the fun. Todd and Joe enjoyed the sauna, while the rest of us kicked back by the fire and enjoyed the conversation and drinks. Eventually, the hour got later and we retired to our bunks for the evening. Sleep that first night was a bit difficult, as the wind howled outside and the huts were routinely pelted with tree bombs. 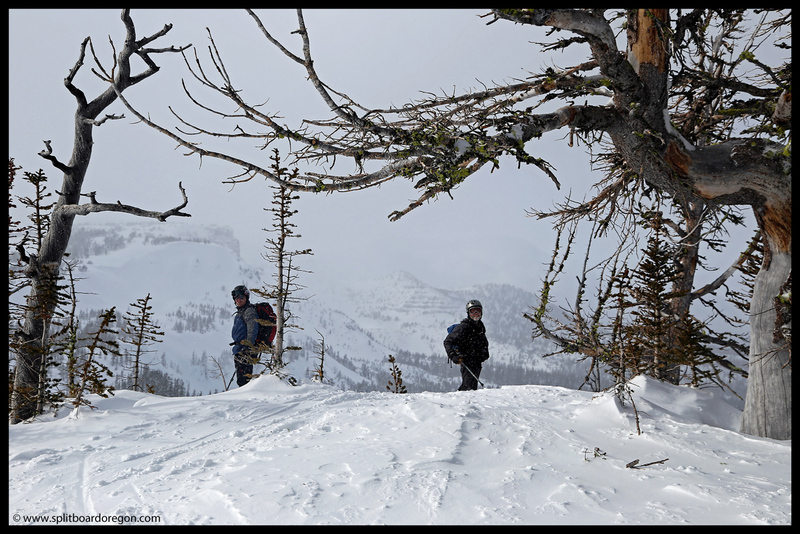 At one point, when I got up to stoke the fire and hit the pee tree, it was particularly windy, and stepping outside the hut I had difficulty finding the trail to the tree as it was filled in with over two feet of snow. The next morning consisted of quite a bit of shoveling just to get out the door. For breakfast, John made up some eggs and sausage, along with toast (made on the stove) and jam. After collecting gear, we set off for the day with the objective of skiing the trees to start with. The previous day’s skin tracks were completely covered, but with six of us it didn’t take too much work to get another track set. 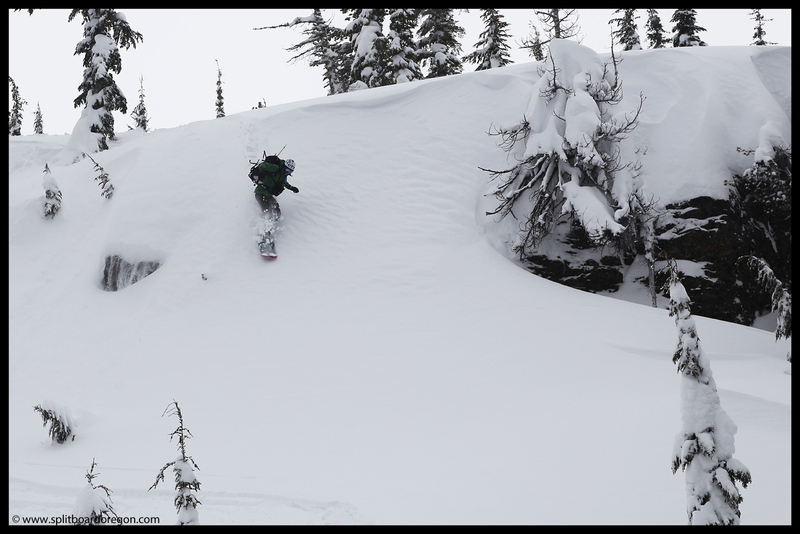 For the first lap, we dropped in east of the huts and enjoyed a really nice tree run back down. The temperature was hovering around 32 degrees, and though it snowed all day, the quality of the snow wasn’t real conducive for pictures. Over the course of the rest of the day, we made several more runs in the trees and in the Playground, finishing up in a small bowl east of the Playground that Dan had been wanting to ski which we named the Dan Bowl. By the end of the day, smiles were had all around, but everyone was looking forward to the following morning, as the temps were supposed to plummet and around a foot of new snow was forecast! 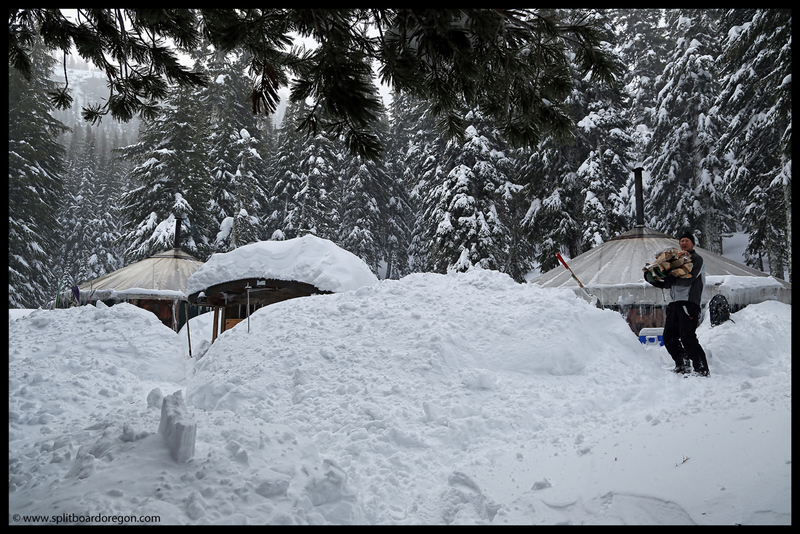 Back at the huts, all our gear was pretty wet given the heavy snow, so we stoked the fire and set about drying skins, jackets, pants, etc. Andy was in charge of dinner, and his turkey chili hit the spot. Tuesday evening was a repeat of Monday, with beers, drinks and conversation enjoyed throughout the evening. 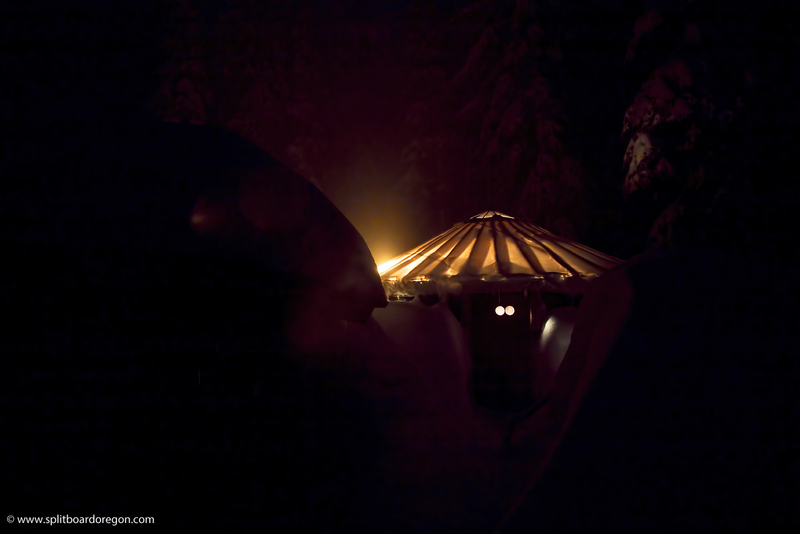 I slipped out and attempted to take a few photos of huts in the darkness and through falling snow. The lighting wasn’t conducive to getting any decent photos, but I snapped away anyway…. 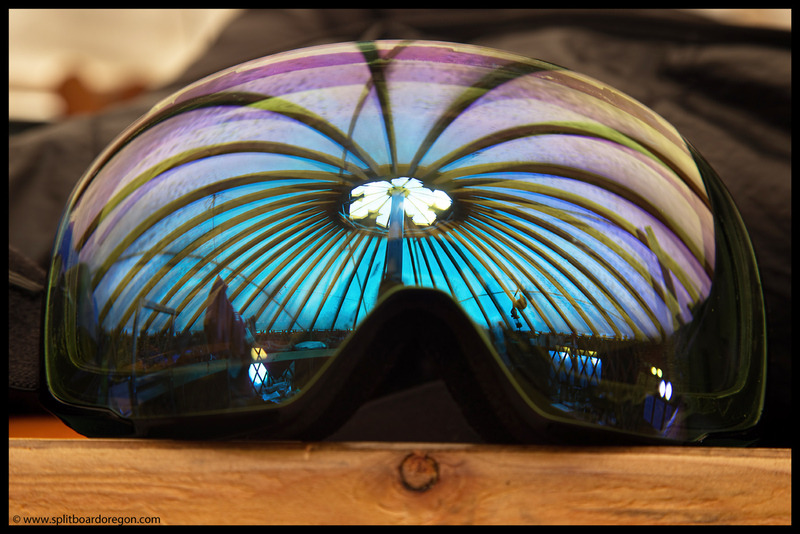 Later, inside the hut, I played around with the tripod and camera and snapped several photos of the hut reflecting in my goggles – something that has become kind of a tradition each year staying at the huts. 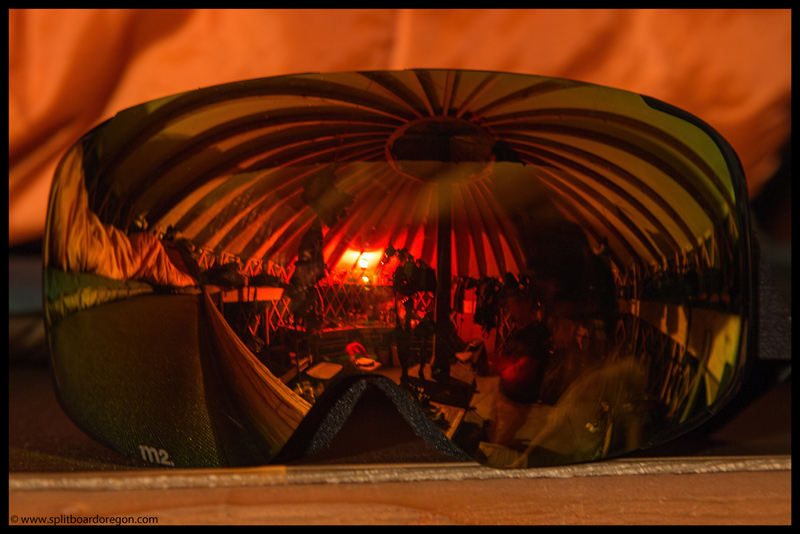 This year, my goggles had a red tint on the lenses, which made for an interesting coloration when placed against the orange background of Andy’s sleeping bag…..
After the photo session, I hit the sauna for a bit with Todd before heading back to the hut to continue where we left off the night before. Another round of snow slushy vodka’s hit the spot, and more conversation with our friends from the Raven hut followed before we hit the sack. 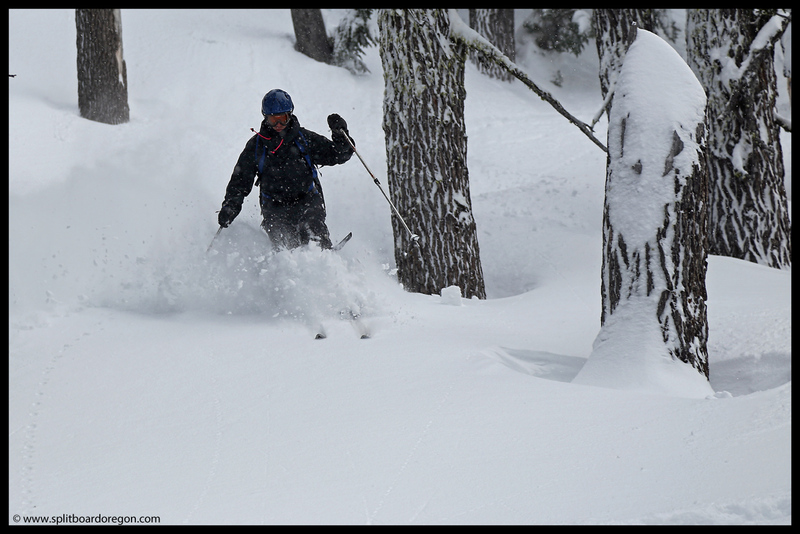 As we hoped, Wednesday morning dawned cold – 16 degrees, and it snowed a foot overnight – perfect conditions. After an omelette breakfast, our group of six joined up with Jen and Andy from the Raven Hut and hit the skintrack (which again was buried under fresh snow). We found really good snow in the Playground, and sessioned that area for a little bit…..after testing the slope by cutting a cornice and doing other stability tests…..
Andy grabbed my camera on one of the laps and snapped dozens of photos as we rode down from the top one by one to the safe zone near the bottom. 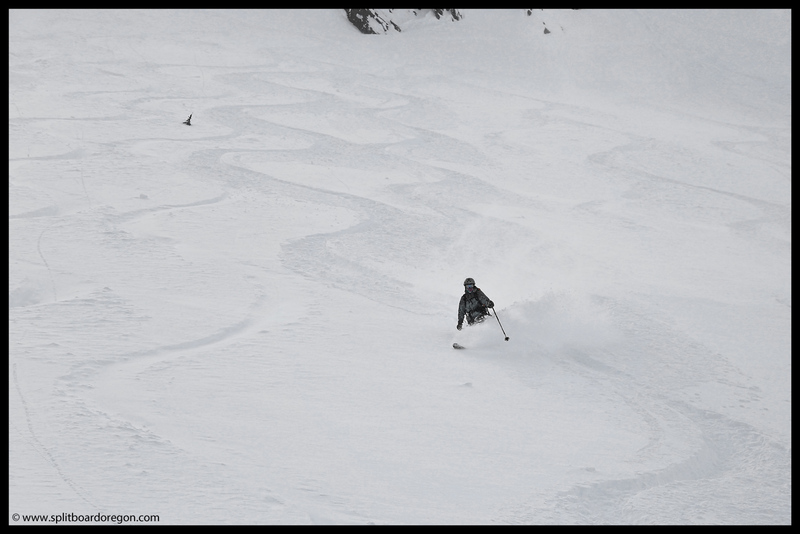 The following two shots are of me just riding out of a blower face shot and of Todd dropping a knee to enjoy a well earned tele-turn…..
After a few laps in the Playground, our crew headed up towards East Peak for a run off the top. 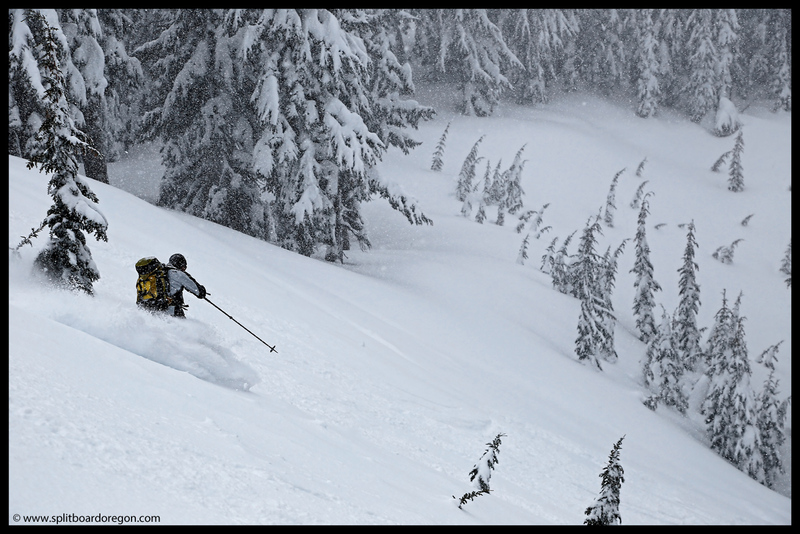 As expected, it was windy on the top, but the snow in the bowl didn’t disappoint. 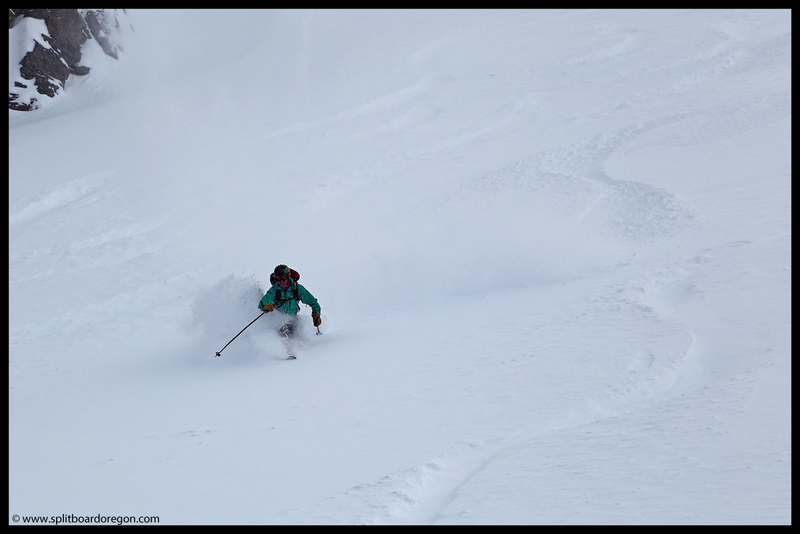 Each turn produced cold smoke that flew over my head, and I wished every ski day could be this good! Stopping midway down at a safe point, I took a little video of the others as they cruised past. 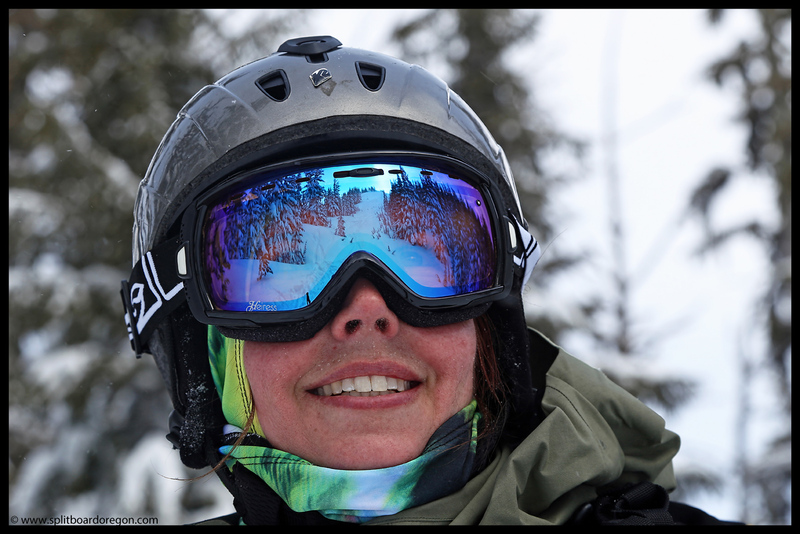 At the bottom, while transitioning back to skins, I snapped a pic of Jen with our tracks reflecting in her goggles…. We worked our way over to the Playground for another lap, then headed back in for a brief lunch at the huts. 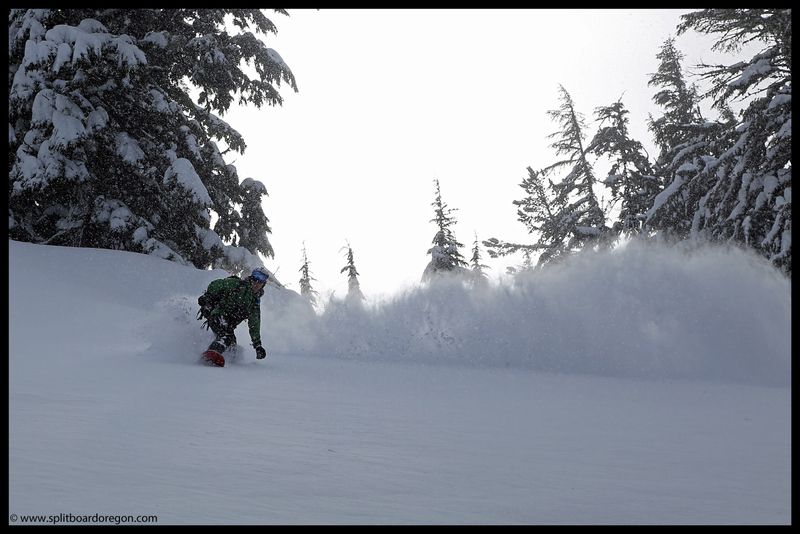 The afternoon consisted of more powder laps off East Peak and lower down on Dan’s Bowl. 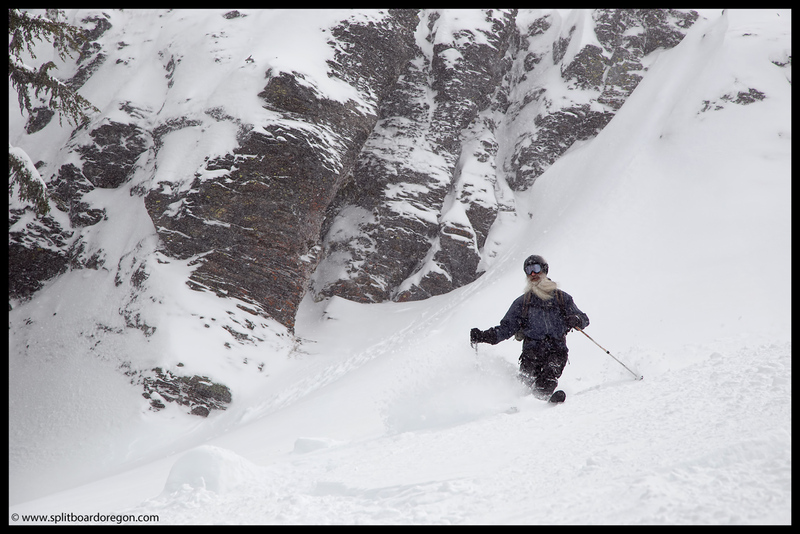 The snow in Dan’s Bowl was about as good as it gets, as is evidenced by the two below photos of Dan and I…..
After hitting Dan’s Bowl, another lap on East Peak followed. By this time I was dragging a bit, so I refueled with a Gu and a power bar. On top of East Peak for yet another run, our previous tracks were almost filled in due to the wind. 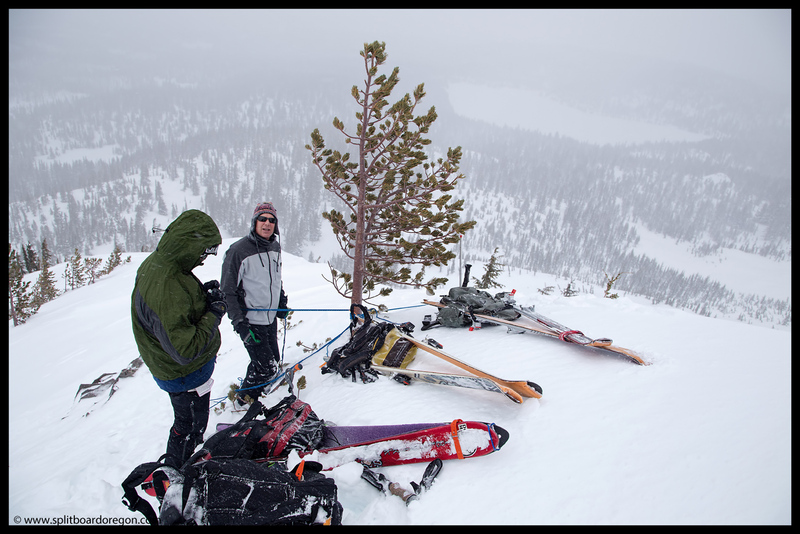 In the below shot, Todd and Joe pause before dropping in with some of Tam’s larger terrain behind them….. The final runs of our day were made in a small bowl just to the east of Dan’s bowl, in an area we hadn’t yet tracked up. 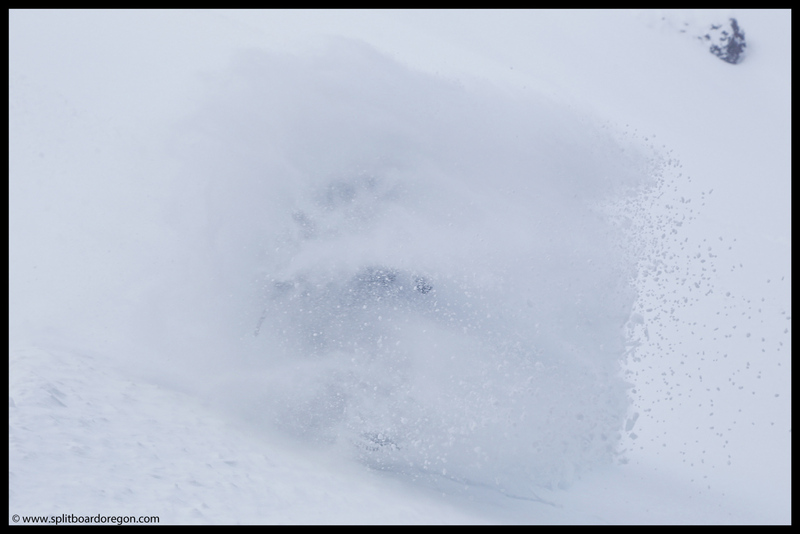 This bowl held some of the best cold smoke of the trip, as evidenced by the photos below that Andy snapped with my camera….. The second run to end the day in the bowl was equally as good as the first, with the added bonus of making light fluffy turns back to the huts. On the route out we passed Shane, who was leading a group of folks up the skin track. Back at the hut, I set to work thawing my seafood chowder for dinner, which included both salmon and halibut caught by my dad and I this summer/fall in the Pacific Ocean out of Newport. In contrast to the previous night, our gear didn’t require too much heat to dry since the snow quality was so light and cold, which was nice because it meant a dry floor. While the chowder simmered on the stove, we settled in and, enjoying a cold beer and the warm fire. Shane poked his head in a bit later, so we discussed the important things in life, like the epic day, the huts, and upcoming/planned spring corn trips to the Oregon volcanoes. Soon, the chowder was ready, and it was definitely one of the best meals I’d had in awhile. A few oyster crackers and some Tabasco added the finishing touches. After dinner, our group discussed plans for our last day, and agreed we’d venture out the following morning into the bigger bowls and see they were stable enough to allow for some longer runs. Sleep came easy our last night, in part from being dog tired after logging three straight days of several thousand vertical. On Thursday, our final morning, we packed our gear, loaded it into the sauna, and enjoyed a sausage and egg breakfast. After breakfast, Todd and I broke trail west of the huts. 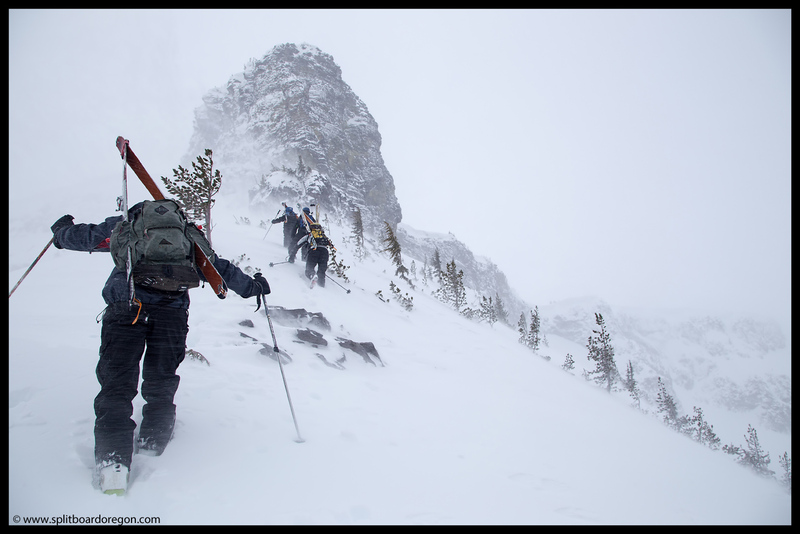 We made good time, and soon found ourselves booting up the protected, but windy ridge below the Prow. Climbing past the rocky crux with the aid of a few trees for assistance, we booted up to just below the Prow and noted the slope was extremely wind loaded. We retreated about a hundred feet downslope to a point where we could set John up on belay and sent him over the side to dig a pit and conduct an extended column test. After 22 taps, the isolated column propagated at two feet. Probably would have been safe to ski, but better to err on the side of caution. Before we strapped in for a few turns, Dan snapped a photo of me with the Prow in the background. 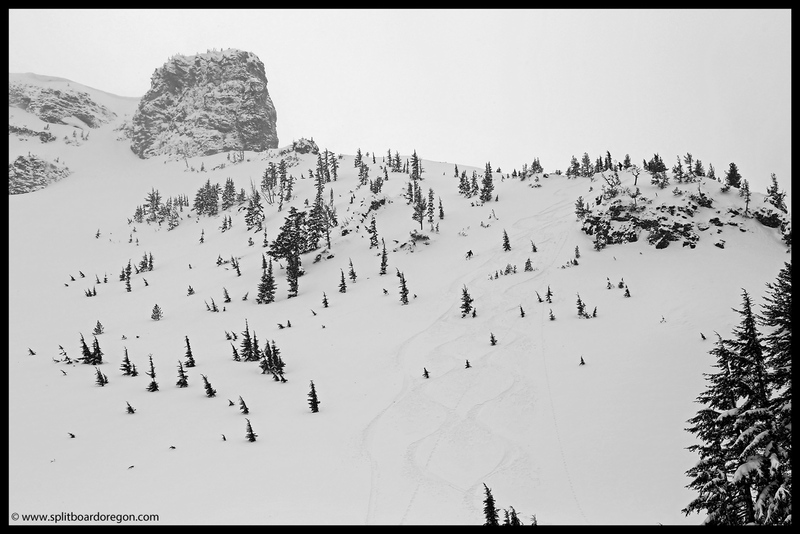 The turns down the ridge were fun even if a bit wind affected. Partway down the ridge, just above the crux climbing section, we found a suitable drop in section that would allow us to get some sweet turns but stay out of harms way from the hangfire above. Dan dropped in first, followed by John and me. 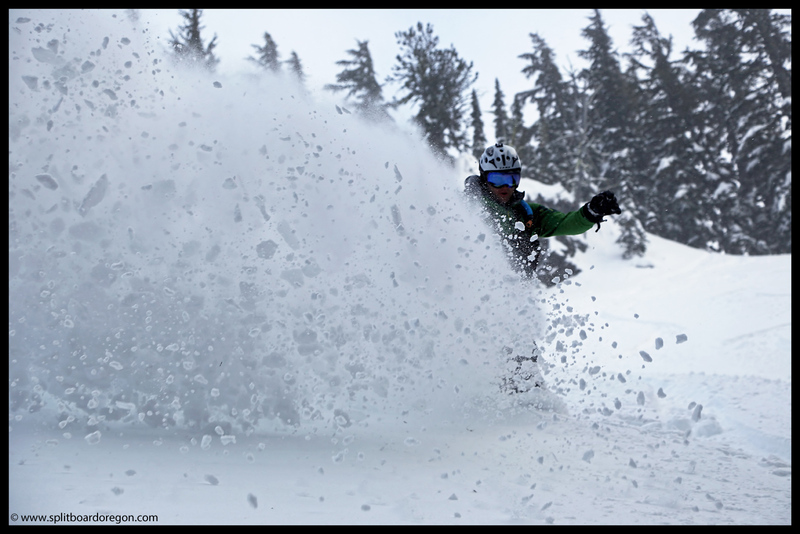 The turns were sweet, and the reward was several faceshots. 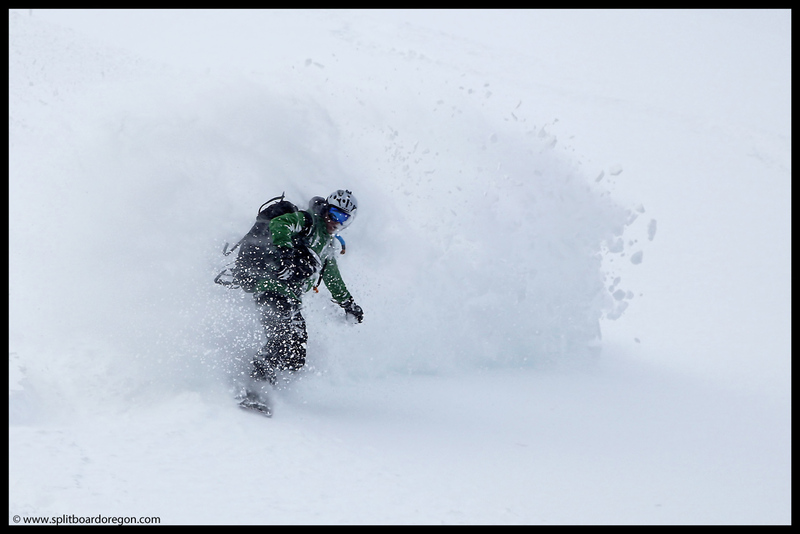 Once I was in a safe zone, I pulled out the camera and fired off a few shots of Andy dropping in…. After riding the slope below the prow, we worked our way back to the east, with the goal of being back to the huts by 2:15 to catch the snow-mo ride out. We set a track up through some perfectly spaced trees, along a small bench, and eventually terminated about 100 feet below the Proboscis. On the downhill, we found several fun features to play on, including a roll over that I couldn’t get enough speed to air off of, but which was still fun to ride nonetheless…. Thanks guys, this year was definitely a sweet trip! Looking forward to more of the same with you next year!